If you want instant information about how much material is crossing your weighbridge(s) sent directly to your smartphone or tablet, a new company called Rockaudit has the answer. Set up by quarry operator Rod Taylor of Killala Rock in Ireland and computer expert Benni Borman, Rockaudit will sell you the hardware and rent you the software to keep control of what is going over your weighbridge(s). The system is not designed to replace your existing weighbridge system but to supplement it to put management information at your fingertips. It can even continue running if there is a power cut because it can be powered by a 12V battery. The company and its product is being introduced at Hillhead 2014, the quarry and mine exhibition on now (24-26 June) at Hillhead quarry in Derbyshire. 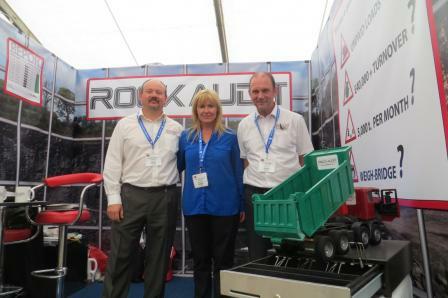 Benni (on the left) and Rod are pictured below either side of Rod’s wife, Sarah, on the company’s stand at Hillhead.